At least 68 journalists were killed around the world in 2009, according to the CPJ. Paris, France (CNN) -- Iran once again has more journalists in jail than any other country, the press freedom group Reporters Without Borders announced Wednesday. "The Islamic Republic of Iran has recovered its status as the world's biggest prison for the media," the Paris-based group said, adding that two sentences handed down in the past week brought the total number of jailed journalists to 42. The plight of journalists in Iran comes against the backdrop of continuing tensions between the government of President Mahmoud Ahmadinejad following the disputed presidential elections in June. Hundreds of thousands of Iranians took to the streets to demonstrate against the official result -- the re-election of Ahmadinejad's hardline government -- prompting a forceful and sometimes deadly government crackdown. Press freedom groups expressed concern about the crackdown on the media which marked a spike in the arrests of journalists. One journalist, Bahman Ahamadi Amouee, was sentenced Monday to 34 lashes and more than seven years in jail, the group said. A second reporter, Ahmad Zeydabadi, had his appeal against a six-year prison sentence rejected, they said. Iranian media also reported on the confirmation of Zeydabadi's sentence. The Tehran Court of Appeals upheld a five-year sentence for illegal gathering and conspiracy, plus one year for propaganda against the Islamic government, as well as five years internal exile and a lifetime ban on political activity, the Web site Tabnak said, citing the semi-official Iranian Students News Agency. There was less information available about Amouee. "It is unacceptable that the Iranian authorities are responding to criticism in the media by arresting journalists. A Web site linked with the reform movement said in late November that Amouee and his wife, political activist Jila Bani Yaqoub, were arrested at their home on Saturday, June 20, a week after the presidential elections. Yaqoub was released two months later but Amouee is still in jail, according to the November 29 report on Norouz, the reformist Web site. "It was not clear what charges had been brought against Amouee, a regular contributor, for years, to reformist media outlets," the International Press Institute said Tuesday. "It is unacceptable that the Iranian authorities are responding to criticism in the media by arresting journalists and handing down prison sentences," IPI press freedom manager Anthony Mills said in a statement. "The crackdown on the media must end immediately and the journalists imprisoned simply for doing their job must be freed." Iranian officials did not immediately respond to CNN requests for comment on the criticism. There are conflicting figures about the number of journalists behind bars in Iran. Since anti-government demonstrators took to the streets over the summer, Iran has tightly clamped down on international news organizations' freedom to report from inside the country. The Committee to Protect Journalists said last week Iran had more than 30 journalists in jail, including at least 11 arrested over the course of three days late in December. The CPJ said it was particularly upset by the arrest of Mashallah Shamsolvaezin, a winner of its International Press Freedom Award. "We have honored him and stood by him as he has defended press freedom against all odds. We are deeply concerned about his welfare and call for his immediate release," CPJ executive director Joel Simon said in a statement December 29. Also on Monday, a group of lawmakers allied with Ahmadinejad proposed a law classifying opponents of the government as "enemies of God" who should be executed within five days of their arrest, Reporters Without Borders said. "We are very disturbed by the calls repeatedly made by the most senior officials for Iran to impose the 'supreme punishment' on detainees, including journalists," Reporters Without Borders said in a statement. 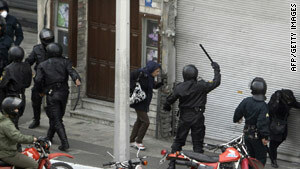 "The regime hardliners are capable of having the crackdown's witnesses executed. There is an urgent need for international bodies to take action before a tragedy takes place, before political prisoners begin being executed," the group warned. The Philippines was the most dangerous place in the world to be a journalist in 2009, the Committee to Protect Journalists said last month in an annual report. More than 30 journalists were killed in single massacre there in November, "the deadliest incident for the press in CPJ history," the group said December 17. At least 68 journalists were killed around the world in 2009, CPJ said. Reporters Without Borders rated Eritrea, in the Horn of Africa, as the worst place in the world to be a journalist in its annual report on press freedom, in October. Its rating was based on a 40-question survey distributed to journalists in 175 countries.